The first step with any Ganutell flower is to twist the wire and floss you will need to complete the petals. The Spinster Cord Twister is the easiest way to spin the rayon floss with wire. You can also use a drill with a cup hook attached. Use any length of floss and wire you want. I usually use the entire length of the skein. One yard works well to begin with and is enough for an average sized petal. If you're using the DMC rayon, separate the floss into three groups of two strands each. The Edmar Glory Rayon does not need to be separated. Spin until you have approximately 11-13 twists per inch. 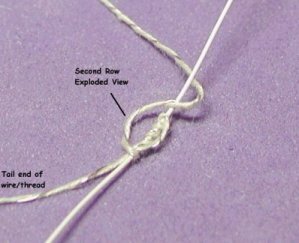 Knot each end of the twisted wire/floss so it doesn't unravel. 1. Cut a 4 inch piece of 24 gauge wire for the center of the petal. 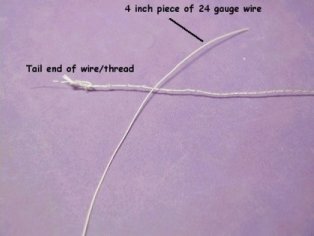 NOTE: From this point on "thread" refers to the spun rayon thread with 30 gauge wire. 2. Lay the thread across the center wire about 1-1/2 inches from the top. 3. 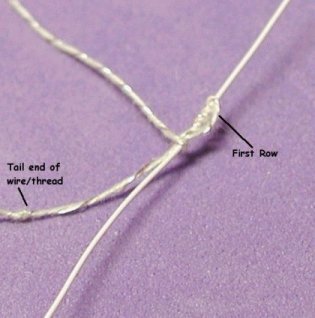 Wrap the thread 5 times around the center wire. 4. Bring the thread down alongside the 5 wraps in the direction shown by the arrow in the photo to the right. NOTE: These instructions use 5 center wraps to start a petal but any number of wraps can be used to change the size of the petal. 5. Lay the thread close to the center wraps. 6. Cross the thread over the center wire, just under the 5 wraps. 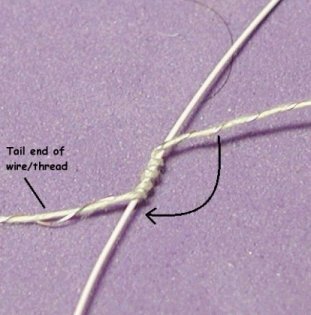 Holding the tail end of the thread against the center wire so that it is secured when you do the wrap in step 7. After 3 or 4 rows you can clip the tail end of the thread from the back of the petal. 7. Twist around the back and to the front so that the thread is pointing to the left. 8. The second row goes from bottom to top and is wrapped from left to right over the front, around the back, to the front so it is pointing to the right. 10. Continue making rows until you run out of thread. Twist the thread with the center stem wire 3-4 times to secure in place. NOTE: These instructions are based on a starting thread of 24 inches which will give you approximately 27 rows. Petals can have any number of rows you desire. Rows are counted straight across the center. Rounds are a complete rotation around the center wire, i.e. 2 rows. Alternatively you can measure the size of your petal width for consistency. 11. Clip the wire at the top of the petal to one-quarter to three-eights of an inch. 12. Fold the clipped wire to the back so it's flat against the back of the petal. 13. Cut a 6 inch piece of 30 gauge wire and center a 3mm - 4mm bead on the wire. Pinch the wire under center of the bead and twist the two ends of the wire together to secure. 14. 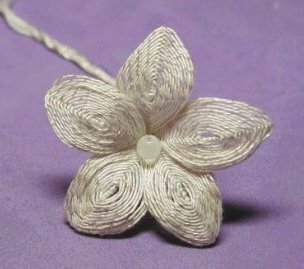 The 5 petals are attached to the center bead using 30 gauge wire. 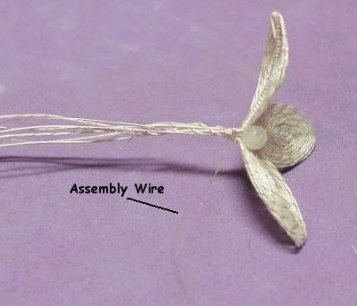 Place one petal close to the center and wrap two to three times with the assembly wire. Add the second petal and wrap two to three times with the assembly. 15. Continue until you've added all 5 petals. 16. Curve each petal so it bends slightly back at the outer tip. 17. Wrap the stem with green or white floral tape.